Police dogs that bite a suspect could soon be exempt from state quarantine guidelines. Walworth County Sheriff&apos;s Deputy and K-9 officer Bob Wierenga says the current 10 day rabies quarantine for dogs that bite a person can keep a valuable police resource off the streets. Wierenga says the units are often needed for multiple calls in a day, but being in quarantine prevents them from assisting the community. 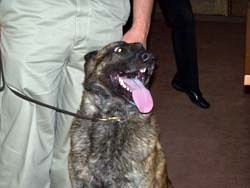 Police dogs frequently have to bite and hold on to a suspect in their daily work. State Rep. Samantha Kerkman (R-Genoa City) is sponsoring legislation that would keep police dogs out of quarantine. The measure would exempt them from the requirement. However, an amendment to the bill would require the dogs to get regular vet check-ups after biting a person.